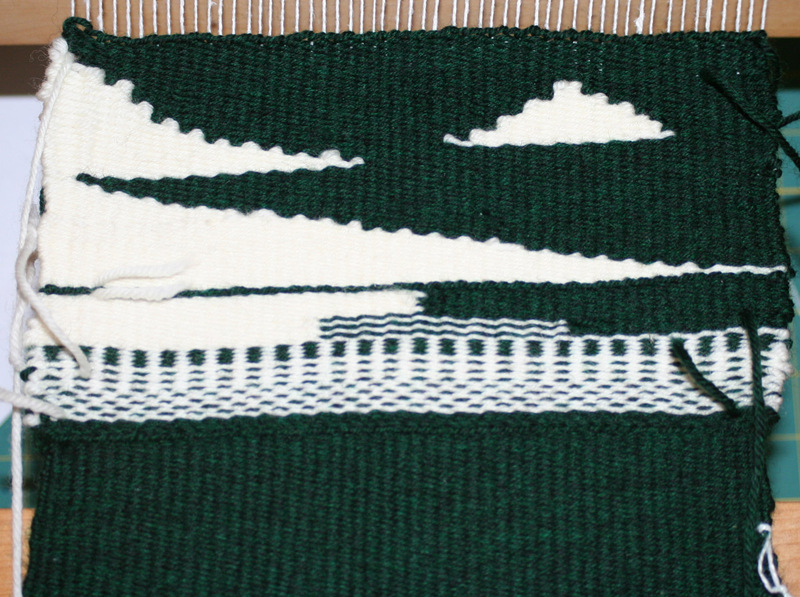 The weave is a little looser than I’d like, and according to Amelia’s method I should really be weaving at 8 dents per inch, so I’m contemplating ordering an 8-dent reed.Â (I don’t think an uneven sleying will “wash out”, since as far as I know tapestry isn’t wet-finished. )Â I sort of hate to orderÂ one for a single use (normally I weave much finer than that), but it would be nice to be able to try a denser sett.Â I may see if one of the loom manufacturers has scraps lying about; all I need is a 9″ length. I did a preliminary test using my new dyeing setup, with blotchy results, primarily due to my trying some shortcuts.Â I’m going to do another test today, this time actually stirring the dyebath alongÂ the way, and see if that works. I weave at 4 epi and use 2 strands of 2-ply wool that comes in at 1040 ypp, but it will also cover when using 3 strands. By using more than 1 strand, you can do some color blending. Seems to me that I have read that Sarah Swett puts her tapestries in the bathtub for a thorough soaking. Can you borrow a reed from a guild member? imho anything that will be cleaned in the future needs to be wet finished. 🙂 I’d try using multiple strands and see how that works. Like Sherri says you can work with colour blending that way, too. I should have mentioned the warp is a 4-ply wool. This is what I use because I prefer to weave tapestry rugs, but nobody will put them on the floor! As Sherri suggested, it ain’t finished till it’s wet finished (apologies to Laura!). There is no reason not to soak an all wool tapestry, assuming the colors won’t run. With a linen warp, people general either just give it a good steam press or, for more steam, use a hot iron with wet towels. With a cotton warp I’d worry about differential shrinkage. Of course some people weave silk tapestries……….